Morlen Sinoway Atelier was one of my clients when I was first working in e-commerce/consulting. They had an outdated completely custom php site that while pretty had become impossible to maintain. Over several months I designed a new site, and we used Refinery and SPREE (Ruby extensions) to build a complete CMS & e-commerce store. Why RoR you might be wondering... at that time the company I was working at was focusing on building assets in both SPREE and Refinery. I worked with a team of frontend developers and RoR experts to get the site built. Below are some of my initial mockups. Morlen, the owner of the business, help define the look/feel he was going after. The project shipped on time, and for a while everything was going smoothly, but at around the 2 year mark this site too had maintenance issues. There were some major security bugs found in Rails, and both Spree and Refinery needed updating. All of this meant that our client had to pay us or "someone" to manage the site. Additionally, the company I was working for had decided not to move forward with building out these RoR assets. Consequently, a constant major issue for Morlen was sourcing a Rails developer to make small site updates. Even just diagnosing the bugs/issues was a lot of work for them. So while they loved the opportunity to build something totally custom, they were feeling familiar pains from this independence. After all this work and positive intent I realized that it was a "two step forwards and one step back" experience for them. This didn't sit well with me, and I promised myself I'd fix their site at my first opportunity. Smaller companies like MSA need their website to just work... having to deal with servers, SSL certificates and platform updates is not a good use of their time. I was able to get insight into this as Morlen and I became friends. We've stayed close throughout my career changes. So when an opportunity to collaborate again presented itself though LOOKCAST I was really excited. I made sure that I approached this redesign from a "bigger picture" business vantage point. This next site would have to last them 5+ years. What would the daily/weekly/monthly maintenance or operation be like? I knew they would be happier on a SaaS platform such as Shopify or SquareSpace. These platforms are wonderful as long as you understand their limitations early on. Having an easy to use CMS that wouldn't break with updating plugins (looking at you WordPress) or need any kind of IT management was very refreshing to the MSA team. SquareSpace ended up being the better choice as their "ease of use" from a CMS standpoint is off the charts good. From a development standpoint I found SquareSpace to be joy to work with 90% of the time. One must be careful when developing a "custom" site on SquareSpace, as platform updates are not pushed to these customized sites. 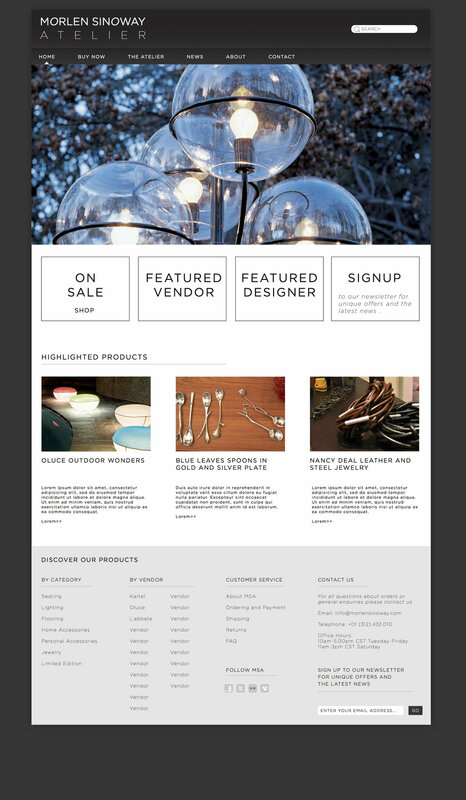 I designed the website to function within the limitations of a template... customizing only parts of the site through SquareSpace's CSS editor and code blocks. MSA also needed some branding and site restructuring. As an Interiors supplier/showroom, e-commerce destination and Atelier they had some predictable brand clarification issues. We developed a new site map, separating their B2B and B2C channels. I'm happy to report that Morlen and his team are delighted with their new site and CMS! Now they have the security of knowing that their site is going to be updated and maintained, that small monthly fee lets them focus on their business!